Last month I reported one possible fix, but because nobody commented on it, I don't know if it worked. In the meantime, I've been corresponding with a Microsoft representative to see if someone on the Microsoft Outlook team might be able to confirm a solution. It took a while, but I finally got an answer. According to the rep, the problem arises when "various applications corrupt the default http:// protocol handler registration." Thus, fixing it is fairly easy. Here are the steps for a Windows 7 or Vista system; if you use Windows XP, the procedure should be similar, though I can't say for sure because I no longer have an XP machine on which to check it. 2. In the Search field, type default, then click Set your default programs. 3. 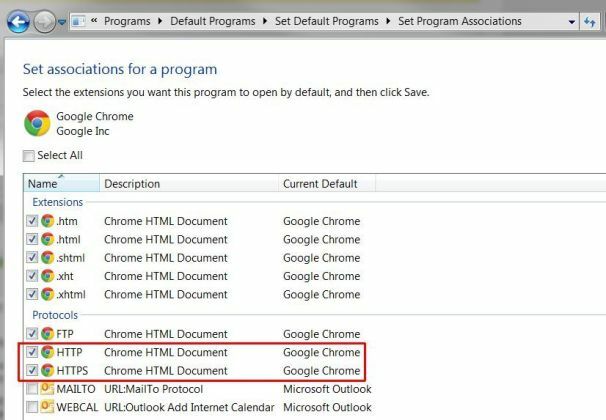 Find the browser you prefer to use--say, Google Chrome--click it, and then click Choose defaults for this program. 4. Check the boxes next to HTTP and HTTPS, then click Save. That should do the trick! I do recommend restarting your PC after performing this procedure, just to make sure Outlook registers the change. If this doesn't fix the problem, please leave a comment letting me know--or, better yet, shoot me an e-mail at the address below.